The sixth-generation Ford Mustang is entering its fifth year on the market. Speaking of triggers, the big news for 2019 is the arrival of a new Mustang Bullitt. The car celebrates this year’s 50th anniversary of the movie “Bullitt” and comes with a unique 475-horsepower version of the Mustang GT’s 5.0-liter V-8. The car has also been fitted with additional performance upgrades, and naturally it can be ordered in Dark Highland Green. Also arriving for 2019 is the Mustang GT California Special, which is inspired by the Mustang GT/CS dealer special introduced for 1968. The modern car, based on the Mustang GT, gives a nod to the original with a blacked-out grille and a stripe. It doesn’t boast any extra power so matches the 460 hp of the stock Mustang GT. Ford has also expanded the color palette for 2019. Taking a leaf out of Dodge’s playbook, the Blue Oval has introduced new vintage-inspired colors including Velocity Blue, Need for Green and the Bullitt’s aforementioned Dark Highland Green. 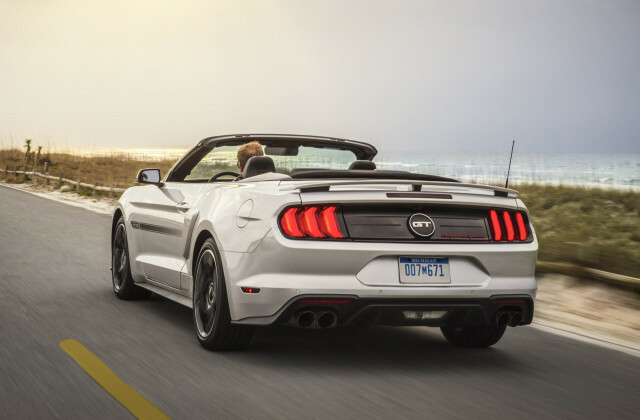 Other updates include a rev-matching function for Mustang GTs equipped with a six-speed manual; a 12-speaker Bang & Olufsen audio system; and an active exhaust system for the Mustang EcoBoost. The range starts with the Mustang EcoBoost, which is powered by a 2.3-liter turbocharged inline-4 delivering 310 horsepower and 350 pound-feet of torque. The Mustang GT sports a 5.0-liter V-8 with 460 hp and 420 lb-ft. Both models are available with either a six-speed manual or 10-speed automatic, and there are also available performance packs to further sharpen things. At the top of the range, for now, are the Shelby GT350 and GT350R models. These come with a 5.2-liter V-8 good for 526 hp and 429 lb-ft, and manual transmissions only. Next year, a Shelby GT500 boasting over 700 hp will join the range.